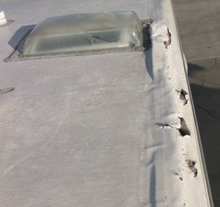 Procedures, Supplies and Equipment to Repair an RV Roof or Rubber Roof. 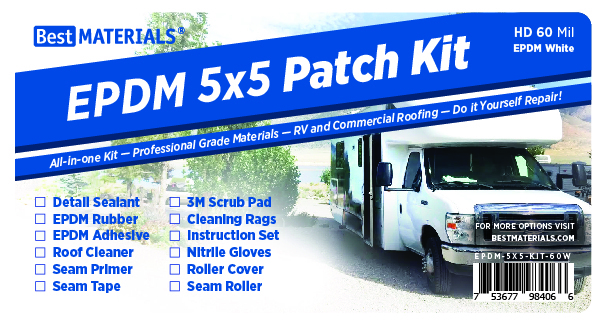 Welcome to BestMaterials.com RV Roof Repair information and resource guide. We are constantly adding new resources for you to use in repair of RV roofs and roofs built with EPDM rubber or metal and others. These solutions also apply to commercial buildings, trailers, patios, and many house boat repairs. We welcome your RV ideas and solutions too. For coating your RV rubber roof with a premium bright-white light traffic capable roof coating, we recommend RoofMate HT is a high performance Elastomeric Roof Sealant for light traffic areas available in handy 1G pails and larger. We also offer complete or partial replacement EPDM Rubber Roofs and also full EPDM Roof Kits. 4.2 What do I do With Edge-Metal or Termination Bar and Screws? 4.3 How are New EPDM Lap Seams Handled When Replacing EPDM? 8.1 What is EternaBond Tape? 8.2 What Makes EternaBond Different? 8.3 Is EternaBond Hard to Install? 8.4 How UV Resistant is EternaBond? 8.5 Will EternaBond Products Stick Directly to Wood? 8.6 Can I do my Entire Roof with RoofSeal Tape? 8.7 Can RoofSeal Tape Withstand Foot Traffic? For RV or trailer roofs and seam repairs, we recommend EternaBond. EternaBond's RoofSeal White is specially packaged for us with a White Ultra-UV resistant surface and wound in economical 50' rolls (rather than 37'). RoofSeal White can be used over all types of roofs including EPDM. UV resistance of RoofSeal White is estimated at 18 to 35 years (tested by EternaBond). RoofSeal is also available in Gray and Black. All finishes are compatible with RoofMate and AES roof coatings. For aluminum trailer and home seam repairs, we recommend A-Seal ®. It is an aluminum faced version of RoofSeal. For recoating a RV EPDM / rubber roof or metal trailer roof, we offer several good choices. For a light-traffic roof, we recommend Roofmate HT (high tensile). It cures harder to take light foot traffic. EPDM Primer is recommended with any EPDM coating. For a complete or partial replacement of the EPDM roofing materials, see EPDM Rubber Roofing Materials. We now offer complete EPDM repair kits using the best products available. No need to worry about your EPDM repair project! 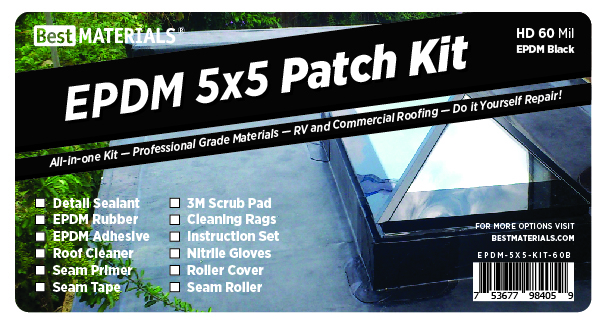 These kits are All-in-One EPDM roof repair. Each job is different, but generally you just need to have some simple tools. 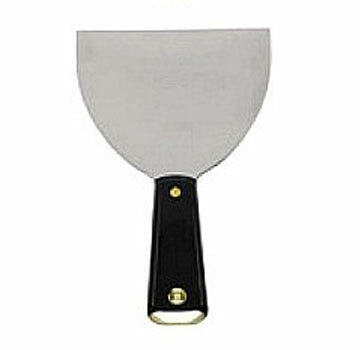 6 inch Putty Knife, Heavy Duty Polished Steel Putty Knife. The roller is the most important tool. It is critical to "roll-in" and flow the EternaBond adhesive. Surfaces must be immaculately clean before applying any type of bonding agent. When preparing a surface for EPDM clean your surface use surface a 3M Scotch Bright Pad (Very Fine) for the job. A razor knife or PTFE Teflon® shears is the best tool to cut EPDM rubber. It is important to minimize jagged and rough edges on your EPDM membrane. A scraper or joint knife is used to remove old unwanted caulking. The best tool for this is a utility blade or scraper. If oil or grease are present, remove them FIRST. When using EternaBond tape (as well as all other roof repair products), all traces of silicone sealants or waxes much be removed. Cut out any silicone caulking, then remove any silicone surface wax with a commercial automotive pre-paint silicone / wax remover. Re-caulk any voids with a NON-SILICONE caulk in the area under which the EternaBond tapes will go. M1 sealant, a polyether sealant, is recommended. Select the sealant or caulk which best matches your roof surface material (and prior to applying the caulk/sealant into the voids, be sure to scrub seams with plastic abrasive scrubber). EPDM rubber roof membrane cleaned before repairing or applying a primer. Brush dirt off and out from under repair area. Clean all dirt and oxidation from the roof surface. The exact method depends on roof material and type of contamination or oxidation. For small repairs to EPDM use solvent and a rag and scrub the repair area. As needed, use a 3M Scotch Bright Extra Fine Pad, or a plastic abrasive kitchen scrubber. Wipe and/or scrub until clean and you have a fresh surface. Eternaclean spray cleaner and a rag is also good to remove contamination. If you are re-roofing large areas you can usually power wash then aggressively scrub surface using a stiff street broom (keep scrubbing until the roof is completely white again). After drying apply EPDM Primer as per directions. Then EPDM adhesive and new EPDM membrane. Seams are best adhered with EternaBond DoubleStick. It's the best, and can be applied without pre-priming. When applying RoofSeal over large areas it is recommended to have a minimum two inches of overlap seam(2" on each side of the repair area, using 4" tape). Use an EPDM Primer when surfaces to be bonded are very dirty (oxidized and cannot be cleaned well). EternaPrime prepares the surface into an adherent platform for the EternaBond tape to adhere to. Also use EternaPrime if the installation temperature will be below 40 degrees F (except when using EternaBond WebSeal and One Step, which can be applied down to zero degrees F). Use EPDM Primer prior to applying Elastomeric roof coatings, such as Roofmate HT or AES-125 over aged EPDM (but the EPDM must be cleaned and primed first). 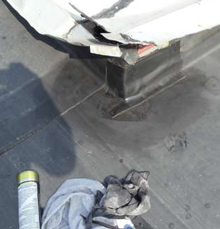 This section contains situations you will commonly encounter while repairing or replacing EPDM rubber roofing membrane. RV roof damage from a viscious blow dealt by an overhead tree branch. 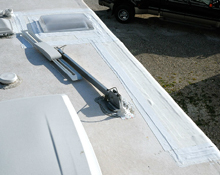 RoofSeal White (4"), our most popular RV roof repair product, was used to repair the damage dealt to the same RV roof. Clean the repair area. Remove any silicones. Clean surfaces as above. Apply M1 sealant to any recesses and tool to a level surface. Let caulk cure. Glue down any loose EPDM areas using M1 or EternaBond Doublestick. Add fasteners as needed to re-enforce the repair area. Let cure 24 hours. Apply EternaBond RoofSeal with two inches of overlap to either side of the repair area, covering any reinforcement fasteners used. Also popular is WebSeal reinforced EternaBond tape and EternaShield coating. What do I do With Edge-Metal or Termination Bar and Screws? For temporary repairs, overlap the entire surface with RoofSeal White. When replacing roof membrane, remove the screws and edge metal strip (termination bar). Replace membrane to just below the termination bar line. Under the termination bar is butyl rubber sealant, typically 1 inch or 3/4 inch wide. Replacement this sealant. When replacing screws, use a bit of M-1 sealant in the old holes. This will both seal and assure the screws will not back out. Then, run a bead of M-1 Sealant along the top edge of the termination bar. Replacement term bar can be purchased from Best Materials. Link to Detail Drawings of Membrane Edge Terminations. How are New EPDM Lap Seams Handled When Replacing EPDM? After adhering new EPDM down, clean the new lap seam areas with EternaClean. Cut DoubleStick seam sealant to length and apply in seam. Roll seam well to fuse sealant. To create permanent long-life very durable seams, a secondary layer of EPDM Primer to any OLD EPDM surface where cover tape will be adhered (new EPDM just needs wipe down with cleaner). Then apply the peel and stick COVER TAPE and roll well to fuse sealant. Set any screws with protruding heads so they are flush. Clean off repair areas. Caulk any deep gaps with NP1 sealant. Apply a layer of NP1 along wood seam about 4" wide with a putty knife. Embed fiberglass reinforcement into NP1. Apply more NP1 and feather out the joint (like taping a sheet rock joint). Let NP1 cure before adding new EPDM sheet. It takes 1-3 days, depending on weather. NP1 will not cure below 50F. Alternatively, use piece of EternaBond WebSeal. Its a peel and stick product which has reinforcing web. Set screws, clean seams, peel/stick and roll well to fuse sealant. Then you can immediately apply new EPDM roofing or make other repairs. Scrape away all old caulking. Use a plastic scrub pad or sandpaper to clean the surface. Swab with solvent and a rag. Be sure ANY silicone type materials are removed. Seal edge using strips of RoofSeal around the flange edge to roof interface, or use M1 sealant. Also be sure and cover all screws. Overlap the vent flange to roof surface edge by about 2" in each direction. As always, be sure to thoroughly roll-in the EternaBond to seal it permanently. The best material to use depends on the roof surface. For sealing aluminum to rubber / EPDM roofs we recommend M-1 sealant. This is a premium high-performance materials designed for this application. The materials will work on ALL roof surfaces. For setting a new vent/hatch/skylight to a fiberglass roof surface we suggest SB-140 butyl caulking under the flange. This sealant adheres very well, and creates a long-term waterproof seal between the base and roof, but can enable removal if service is needed. Its also UV resistant & paintable! For resealing RV windows we recommend M-1 sealant or Duralink. Either has tremendous adhesion to glass and the RV and will provide many many years of trouble-free sealing. Clean surfaces and seal using EternaBond WebSeal. WebSeal’s unique weaved fabric backing and microsealant composition you to use the tape not only on all flat surfaces but also perfectly seal around curbs, angles, pipes and bolts, making the tape ideal for any roof-sealing application. It is especially useful for difficult details, penetrations, areas where water ponds, and even imperfect surfaces. This 30-mil tape has no memory, so it will not “spring” back to it’s original shape when it is molded to fit unusual shapes, yet it remains flexible (expands and contracts) in temperatures as low as negative 70 degrees Fahrenheit. WebSeal is designed to have a secondary surface coating over the top, EternaBond UV Protector. RoofSeal is one-step, but does not form as readily around irregular surfaces. Scrape away caulking around screws that secure the item then remove screws. Cut away all old caulking at the metal vent-flange edge (avoiding cutting into the rubber roof). Use a putty knife to get under the vent and loosen. Carefully lift off the old vent to prevent tearing the rubber roof. Clean the roof area under and around the opening. Fill any screw holes with caulking. Remove ONE side of the non-stick backing and apply EternaBond Doublestick tape to the bottom side of the new vent flange. Press the tape into place, then roll well to seal tape to flange. (Note: If needed, you can easily "double stack" the Doublestick for sealing greater gaps). Alternatively, use Butyl Rubber Sealant SB-140 (much less expensive, yet quite good). Remove the remaining non-stick backing from Doublestick sealing tape. Carefully Position the new vent cover over the opening and press hard into place. The Doublestick tape provides an even, permanent, watertight seal. In lieu of this, use a heavy bead of caulk/sealant under the flange. With the vent positioned, secure it with new exterior grade screws, such as #9 Stainless Steel HWH with Sealing Washers. Tighten all screws gradually to pull the flange down evenly and seat the DoubleStick. Finish the sealing by using strips of RoofSeal over the flange outer surface. Cover the screws and vent flange edge and roof surface 2". As always, be sure to thoroughly roll-in the EternaBond to seal it permanently. For a seal which is temporary or can be more easily removed in the future, use butyl sealing tape under the flange following the above procedure for DoubleStick. Form a good sized bead mid-way around the bottom of the vent flange in the screw hole area. Place the vent. Move the vent around a bit to seat the vent-to-flange putty to the roof surface. (Note: Butyl Sealing Tape forms an air-tight, but not a long-term water tight seal). With the vent positioned, secure it with new exterior grade screws, such as #9 SS HWH W/NEO SEALING WASHER. Tighten all screws gradually to pull the flange down evenly and seat the tape. After screws are installed, caulk the outer edge of flange-to-roof interface and screw tops with M1 caulk/sealant. OR, seal edge using strips of RoofSeal around the flange edge to roof interface, or use M1 sealant. Also be sure and cover all screws. Overlap the vent flange to roof surface edge by about 2" in each direction. As always, be sure to thoroughly roll-in the EternaBond to seal it permanently. Before coating or recoating your RV EPDM roof you need to check and repair all water leaks in addition to cleaning the roof. The entire coating process may take up to a week considering cure times for multiple coats. Old RV roof with worn out coating. This is the same RV roof pictured above. It has been recoated and will now reflect UV rays and prevent water leaks and damage. Clean repair areas. Remove all silicones or old coatings. Stick down any lifted areas using EternaBond DoubleStick sealant (no cure) or M1 Sealant (which must cure). Then apply WebSeal, 4 inch. Before applying a coating to EPDM roof, an EPDM primer is recommended. Apply an EPDM primer in a thin layer. Let cure (about 30 minutes). Apply EPDM roof coating, such as RoofMate HT (which will take light foot traffic), or AES-125 epoxy coating (which is very long lasting). Two coatings are required. This is the basic process for coating or recoating an EPDM roof. Repair water leaks using the techniques mentions in this article. Spot clean before repairing the roof. Use a 1:3 bleach/water mixture applied with a stiff street broom or scrubber on other tough stains and mildew. Try TSP and water if the bleach does not perform. Or use EternaClean cleaner and a rag on oily and greasy areas. Afterwards power-wash the roof and let it dry thoroughly. Apply an EPDM roofing primer as per manufacturers instructions. Open the can and remove any skin at the surface. Stir with a paint stick for 4 to 5 minutes, or with a power mixer. Apply the first coat with a 3/4" nap roller at rate as specified by the manufacturer. Let it cure as required, approximately 1 to 3 days depending on the temperature. Apply a second coat in the same manner, except this time roll in the opposite direction. We recommend a light gray or tan color. Typically gray and tan colors hide dirt, look better, and last longer than white coatings. RoofMate HT is a high performance elastomeric Acrylic roof coating with both a High-Tensile and high elongation. Non-Flammable. Easy, roll-on application. Quick curing. Suitable for about 6 years before recoat. Prime before using. Ultra Shield is also an elastomeric acrylic roof coating with an attractive performance and cost effective. Easy to apply (roll-on). Quick cure. Non-flammable. Comes in several standard colors. Not traffic grade. Suitable for about 5 years before recoat. Prime before using. AES-125 is a 2-part elastomeric, waterproofing grade, very long-lasting coating. Non-chalking. Requires practice to use. Not traffic grade. White color can yellow over time. Liquid rubber and EPDM in a 2-part solvent base. Highest cost. Lower elongation, Not oil resistant. Flammable when uncured. The most difficult to work with. Not recommended for foot traffic areas. Popular EternaBond leak repair products include RoofSeal, WebSeal and AlumiBond / A-Seal. These are the finest available, easy to use and provide easy yet permanent solutions for roof leak repairs and emergency repairs on all types of roofs, underlayment repairs, RV roof repairs, gutter seams, and other types of waterproofing repairs. Click here for a listing of all EternaBond RoofSeal White products. 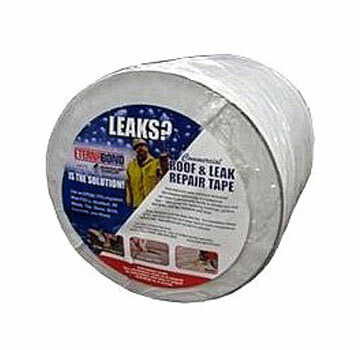 EternaBond Leak Repair Tape is one the most aggressive adhesives available. EternaBond is manufactured from specially formulated elastomeric resins (MicroSealants) bonded to woven, aluminum, or mixed polymers for maximum conformability. These materials are prefabricated to provide uniform thickness and will expand/contract within normal ambient thermal conditions without ever hardening or losing its adhesive qualities. EternaBond is perfect for surfaces like rubber, fiberglass, metal and even polyethylene and is now available in many convenient sizes. Installing EternaBond is as easy as putting on a piece of tape! EternaBond requires no glue, mixing, or caulking. For quick, emergency repairs EternaBond usually will not require cleaning (although they recommend the repair to an unclean surface be checked at a later date for proper adhesion) and in many situations, EternaBond can be installed underwater. DO NOT INSTALL OVER SILICONE. How UV Resistant is EternaBond? Will EternaBond Products Stick Directly to Wood? Yes. Be sure to "roll-in" product, like on other applications. Can I do my Entire Roof with RoofSeal Tape? Yes. EternaBond RoofSeal White is available in widths up to 36". You simply lay down overlapping strips to cover the roof (and using the pre-cleaning and post roll-in processes). Full sheets of replacement EPDM is less expensive and much more durable. Can RoofSeal Tape Withstand Foot Traffic? No. The outside white layer is not traffic grade. You should use EPDM Coverstrip tape for traffic area repairs. We suggest application of high-traffic roof walkway pads in the traffic areas. We recommend running a thin bead of M-1 sealant along the visible tape edge (just enough to cover the exposed EternaBond adhesive at the edge). 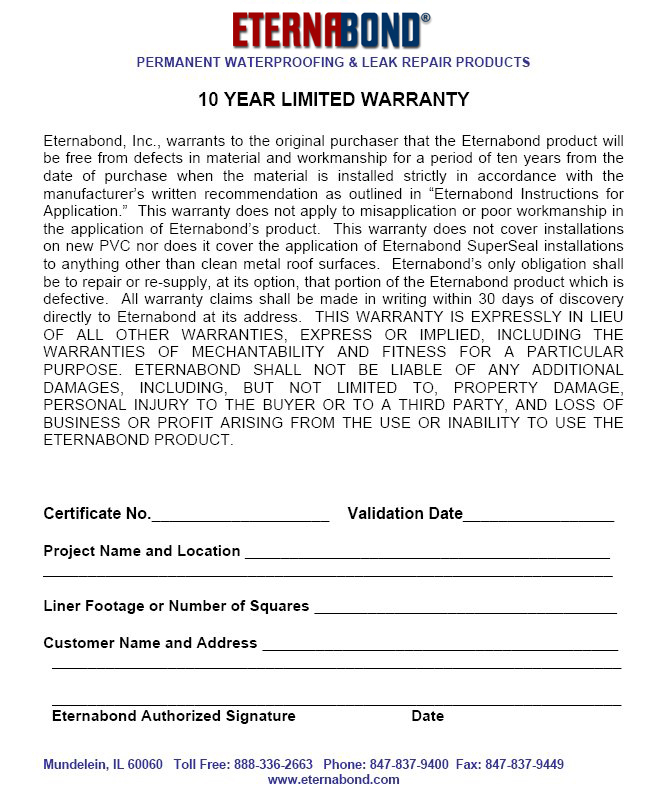 EternaBond provide a 10-year limited warranty. Click here for the details: EternaBond Warranty. 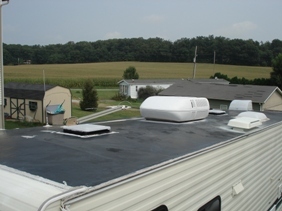 RV Roofs can be: EPDM, TPO, Metal, or Fiberglass. 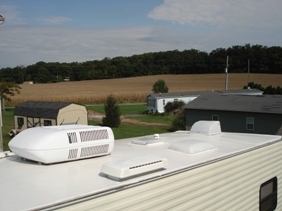 EPDM (available in black or white) and TPO are the most common types of RV roofs. Best Materials has everything you need to repair your EPDM Roof. EPDM is synthesized from ethylene, propylene and Diene Monomer. EPDM is a highly flexible and stable material. EPDM creates the binder for the final product, vulcanized EPDM mixed rubber, which contains carbon black, antioxidants, antioxidants, oils, and curing agents. The oils are added to act was plasticizers and low temperature flexibility. Over time, the oils can deplete and the EPDM sheet will shrink. This is one of the primary aging factors. EPDM is not resistant to oil or many solvents. Roof repair products must be compatible with EPDM and many are not (tar, bitumen, and high solvent content products can attack and decompose EPDM). EternaBond's unique adhesive system has solvent or petroleum products. It is 100% compatible with EPDM and all other roofing materials. For a final coating, Roofmate HT is excellent. It has good wear resistance, and is solvent free so that it can be used directly over EPDM (EPDM Primer recommended). Thermoplastic polyolefin (TPO) roofing was introduced to the RV industry in about 1994. It has a glossy white surface. TPO sheeting claims to provide tear and puncture resistance 20 to 50 percent higher than un-reinforced EPDM rubber (depending on the material thickness - Best Materials). The material offers excellent UV protection, will not retain odors and is resistant to rot. It is easily melted or burned. This is the quickest method to identify it. Cleaning TPO can be done with a membrane cleaner and a soft nylon brush or sponge.